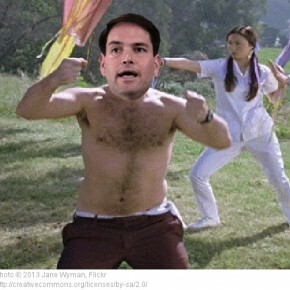 Will Florida senator Marco Rubio land a punch on Obama that hurts? It’s true: African-Americans cannot get angry. And if they do, they’d better apologize lickety-split. Rubio is sure trying to pick a fight with Obama, after it came to light that the Obama team handwrote a reply to a colleague — University of Texas art professor Ann Collins Johns. This was after he suggested on a GE shop floor in Wisconsin that students should study areas that will give them the possibility of employment. Again, fighting between two poles, or should I say bullies (SCAMs and SLAMs), does not mean that Obama’s going to go down. But it does mean he’s not going to be a second-term president that the Right or the Left truly ignores. I guess what we can conclude is that it will all be fun. In looking for the vortex, or the whirlwind, in terms of the intersection of political timing when it comes to rhetoric and ideas, it’s easy to look for all the punches. That is, look for the conflict and you will have possibly found your vortex, or the eye of the storm. Put differently, Obama can’t be a lame duck if all he does is keep ducking as Hillary runs. I can imagine he’ll be ducking until January 20, 2017.